The recipe consists of 3 steps. Then rub the marinade with the fish. And cook the fish in a microwave. 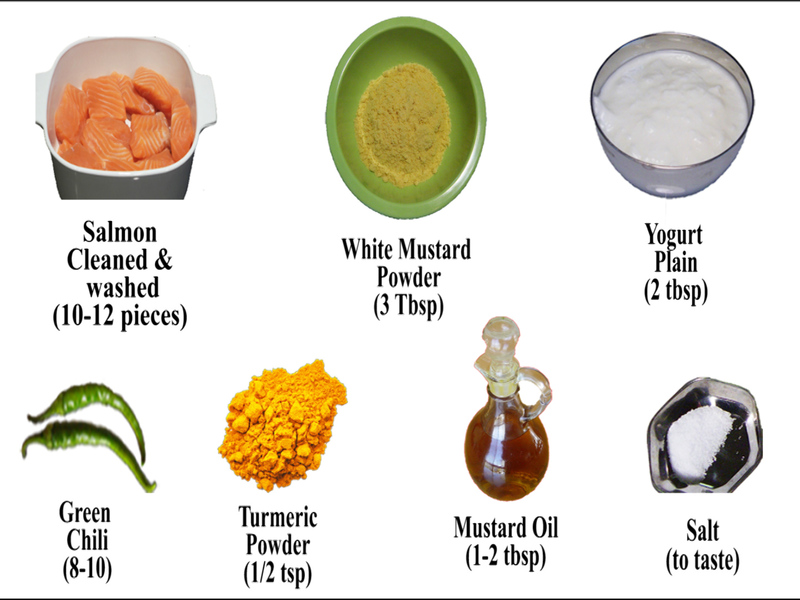 In a mid-size bowl mix the mustard powder with yogurt, green chili paste, turmeric powder and salt. Add about 2 tbsp water. Add 1 tbsp mustard oil. And mix those thoroughly to make a uniform paste. Now, add this marinade on the salmon pieces and rub the marinade with the fish. Add 4 whole green chilies. Cover the pan and put the pan inside the microwave. Heat the pan in the microwave oven for 8-10 minutes. We used 8 minutes at 70% power level. You may need to use different setting based on the power level of your microwave. However a little difference in time should not make much difference. Then bring it out and carefully turn over the fish pieces. The pieces may break if it is already close to done. Or you may need to heat the covered pan again for another 2 to 4 minutes to complete cooking. Check if the fish is done by sticking a fork in the fish. If it passes easily then the cooking is done. This completes the Salmon Shorshe. It takes about 15-20 minutes and serves 3-4 people. Serve the salmon shorshe with hot steamed rice.